Note: EPP currently does not support PowerTeacher Pro based sections. As a result the scores page page fragments may need to be removed to show assignments correctly. Districts not utilizing the new pages added via EPP should evaluate if the stock PowerSchool SIS features are sufficient. Starting with PowerSchool 9.2 the core application provides controls to disable functionality which is also honored by the Mobile App. These settings can be found under Start Page > School Setup > Parent/Student Access. 1. Localization of all the new pages. Future updates should include other language packs as well. 3. Database Extension table created for the demographic modify fields included. Please install as a plugin even if you plan on using custom/web_root for your files. This will allow the localization tags and db extension to install. You may still install the web_root files within the zip to your custom/web_root if that method of customization is desired. IMPORTANT - PowerSchool no longer allows students to edit their own student record. Because of this 1x Class Registration ONLY works when logged in as a Guardian. Students will have full Class Registration ability if 1x is enabled. I am unsure of what version this happened in, just fyi. This is a new Parent Portal with more options for student screens. Allows a school or district to show or hide icons on the public portal. The solution now cleans up the automatic e-mail page options when those options are hidden from normal view and displays a message when the grade & attendance page is hidden. Incorporates Roger Sprik's customization that allows a student to submit course requests just one time. V 1.0 - 2.X Changes included in documentation. Updated \guardian\scores.html fixed un-named if’s that cause all sections assignment scores to show. This download is currently not in plugin form! Replaced /admin/district/home.html and /admin/schoolsetup/home.html with page fragments. If you have older versions you can now remove these custom pages. Replaced /wildcards/guardian_header.txt and /wildcards/guardian_header_yui.txt with page fragments. Please remove custom page if it exists from previous version of EPP. Replaced customized versions of standard PowerSchool pages in guardian portal with page fragments. Please remove custom page if it exists from previous version of EPP. Add in link that will show in the upper left side of the admin home menu if there are any updates from the parent portal to be acted on. The link will go away once all have been completed. Fix for request form. Previously would auto redirect if the checkbox value was True instead of 1. Now checks for either 1 or True. Localization tags added to all pages so that schools can localize any EPP page as needed. Future updates should include more language translations as they are being worked on right now. This modification was sponsored by Orleans Public Schools. Migrate demographic update custom fields to a new database extension. All pages were updated to use the DB Extension. This should improve performance. Added custom insertion points in /admin/students/parentdemochange.html and /guardian/parentdemographics.html. Insertion point is called pdsdemochange.footer. Thanks to those at PSUG-MI 2015 for the suggestion. Fixed performance issues by making home page query more efficient. I need help with this too. I need help with this too. Did this ever work for you? I just downloaded the EPP to our district. What code do I use to "approve" a check box field in parentdemochange.html? We use a checkbox to show whether or not a parent "lives with" their child. The field is called cnt1_liveswith. If I enable traditional & standards grades in parent portal settings for a school, then log in to the public portal with a student ID and password, click on a score for a course to drill into the course details screen, no assignments show. If I enable only traditional grades, it works fine. The prior version of the EPP I had installed did just the opposite. With T&S scores, when I went to course details for one course, I saw all the assignments for all courses that student was enrolled in, not just the ones for that course. I have PS 7.2.3 installed, and just now installed the latest EPP, 3.3.2. Is there anyway that parent/student can view the grades from the courses that had belong to the past semester. For example, our Humanities 1 class finished in Oct. 31, in the quick lookup Admin side, I can still see this class listed in there, but when parent/student log in, they can't see it anymore. Any idea how to turn it on for student/parent? Check your Current Grade display - what does it say for Parent/Student Access term? Mine says 12-13 and I believe they can see all courses. At least that's the way it worked last year. Yes it does say 12-13, but under term 12-13, we also set up terms called Quarter 1,2,3,4. When Quarter 1 ended, parent/student can no longer view courses under Q1 anymore. However, in Admin side under quick look up, we can still view these courses. Is there any way that we can let parents to view these courses and grades? Hello! We are considering installing this entire customization, but was wondering until we are ready to do so, is there a way to just have a screen that displays the student's schedule for the current term, and for future terms? We have a student's schedule that is not showing on the student or parent portal - error message - this information not available for this student at this time. All of our students' are displaying fine - this student arrived in the last two weeks - everything is correct on his profile. Any suggestions on what might be happening? Thank you for any feedback you can provide. We seem to have a problem with the My Schedule page at schools that schedule classes by quarters. Instead of getting the whole year's schedule listed at the bottom, Quarter 1 is repeated 6 times. At schools that only have semester classes it works fine and you see both semesters. I've looked at the html and tlist sql, but am unsure what to change to make it work as there appear to be some x codes at work. I've created screenshots of a bad (school with quarter classes) and good example (school with semester classes). We have the same problem. Under List View, when you click on Entire Year Schedule, Quarter 1 repeats six times. NOTE: Changing the parent term in Current Grade Display to 12-13 does not fix this problem. I have a little more information about the Schedule Display Issue. When I went to the /admin side of PowerSchool, selected a student, List View, Entire Year Schedule, I had the same problem. Quarter 1 displays six times. Refresh the page, and the schedule shows up correctly. Refresh again, Quarter 1 displays six times. Apparently this is a known defect - see knowledge base article 66840 on PowerSource. Please create a case on PowerSource if you are having this problem so we can get this resolved. I have quarters and trimesters in one school. How could I get the school info page to show the trimesters or both, I have other schools using the portal and their semesters show up and not the quarters. Has anyone used the Enhanced Portal with version 7.5+? I'm using it with 7.5.0.1 and everything seems to be fine. It doesn't show the new MyData feature, so you have to update the home page. I see what I need to type on the admin/home page, but exactly where should it be placed? There are no course requests for this student. However, if I turn customizations off, the Class Registration link takes me to the course request screen. On the advice of Matt Freund, I tried deleting all custom html files associated with this enhancement (both the original version I had installed and the newer version I installed today). I then re-installed the newest version. The request screens still did not work. I again deleted the custom html files associated with the enhanced parent portal. I have customizations enabled and the request screens working. Since I would like to use other features of this enhancement, I would appreciate suggestions on how to get the request screens to show correctly. Did you receive an answer to this? I am having the same issue. There are a few things that you need to do in order to turn allow requests to be submitted in the public portal. 1) Under the school that is to be the students next year school, you will want to go to School --> Parent Portal Settings. Then change the setting for Student Schedule Requests from Hide to Edit Full. Note: If the student is an 8th grade student at your middle school and going into 9th grade at the high school, this process will need to be done at the high school. 2) Under the school that is to be the student next year school, you will want to go into PowerScheduler. Go to Screen Setup. Make sure that the checkbox is checked for the "This grade may register for classes". 3) Under each student, there should be a checkbox that says "Allow student to submit requests" under the Scheduling Setup page for the student. This field must be checked. You can mass fill this by selecting all the kids in a school or selecting a specific grade, clicking on Student Field Value. The Field is Sched_AllowRequests. Turn turn it on set the field value to a 1. Turn turn it off clear the field value. All 3 of these need to be turned on, in order for Parent or Student to enter requests via the public portal. If you want to turn off the ability for Parents to enter request, but to still allow counselors to enter requests. Then you will need to change 2 items. 1) For each student on the Scheduling Setup Page the "Allow student to submit requests" checkbox must be unchecked. To do this in mass, select a grade level or the entire school and do student field value for the Sched_AllowRequests field and select the option to Clear field value. This will remove the 1 value and replace it with nothing, which will cause the checkbox to be unchecked. 2) At the students next school, you will want to go to select school from the left menu then select parent portal then change the option for Student Schedule Requests from Edit Full to either View Only or Hide. Thank you so much. These instructions are GREAT! It is now working. Thank you Michael - this worked for me too. Next to XYZ School under Score Detail Setup select “Traditional and Standard”, When Traditional and Standard is selected the score details do not appear in the guardian login after selecting a grade on the scores.html page. When the Score Detail is changed to Traditional on the front end, then log in as a parent/guardian and a grade is selected (A) under Q2 on the grades/attendance page the scores.html page will load the assignment scores. I just tried this on my test server and I'm not seeing that. If I click on a student's Q1 grade from the Grades and Attendance screen I get the same information regardless of its Traditional only or Standards and Traditional with the exception of the Standards column being added. Basically the page works so that if you select Traditional and Standard then data is pulled by a custom query developed by Brian (I think). If you select Traditional only it pulls what Pearson coded in. So if traditional is having issues then for some reason Pearson's default code (or at least the default code that was there when the customization was made) is what's faltering for some reason. Unfortunately the Pearson code looks to be a x code so we can't even decode the issue. Do you know if the problematic results happen for every class or just some classes? While unlikely its possible that there is some character that doesn't agree with whatever PowerSchool is doing in the x code and that's what's causing your issue. But I'm really grasping at straws now. We are seeing exactly the same thing here, happening across all subjects and for all students. Basically the scores.html page is not listing the assignments at all if Traditional and Standard is selected in the Parent Portal options, but lists them if Traditional is selected. Of course this only gives the basic assignment scores without Standards scores, which isn't quite what is wanted! This is using Powerschool 7.6, and things seem to only have broken since this update. Not sure how to proceed here, except for the time being to use just the traditional setting, so at least parents see something. Yes, it is happening with all subjects. We only have one school within the district set as traditional and standard and they are the only one having the issue in that district. We have another district who also used traditional and standard for a few of their buildings and they have exact same problem. We've tested with two different logins from two different school districts and no matter what class we select the issue occurs. When we change the front end to traditional the list appears, set it back to traditional and standard and no list. Any update on this issue at all? It can't be widespread as only a few of us are seeing it, so maybe it is a problem with the December Powerschool 7.6 update? How easy would it be to add a link to the Cumulative Info screen? I get asked for GPA and class rank by students and parents on a daily basis. That would be very helpful to have on the parent portal. Thanks Dan. I added it above the Quick Lookup screen as you suggested. I previously lived in Yakima and worked from Sunnyside, Toppenish and Yakima. Now in Idaho. I am following your instructions to allow parents to enter demo updates. but I get Invalid field name when I hit submit. Other then that everything looks good. I can see on the admin side the Parent Demographic Change page. I think you have an extra "d'" in that field...I think it is supposed to be "enabledemoupdate"
Also, where is the demographics Change page showing on the admin side? I am unabel to see it. I only have one student enabled to be able to update the demo info until I can get it wokring, but I am unable to see onthe admin side where that update page is. I have had the Enhanced Parent Portal installed for the last few years. We noticed that we cannot get the 'Class Registration' to show. Can I simply copy the new files from the latest version (3.3.2) into the sub-directories as I have no idea what the files from the older version were called? I'm hoping that installing the latest version will correct the omission. Hi, we have PS 7.2.3 with EPP 3.3.2. Under the parent portal, the teacher comments page shows no comments, even when the admin-side teacher comments page does. There is also "no comment" when they drill down to the assignments page via Grade History. When I copy the working, admin-side teachercomments.html file into the guardian web directory, it breaks -- no comments. All of our teachers use PT Gradebook, no PowerGrade; we tell them to store comments in Q1, S1, and S2. Can we hack up the query to do the needful here? Even after I reverted to the stock teachercomments.html, it STILL wouldn't work UNLESS we set Current Grade Display's "Current Grade" to be "S1" -- which is totally bogus, since we've now started S2/Q3. Even if we set CGD's "Parent/Student Access Term" to "12-13", which messes up the main page since it shows all the kid's 1st and 2nd semester courses alternating down the list and irritates everyone, the stock teacher comments page wouldn't work; it doesn't obey the same logic that it does on the admin side. This has been escalated as an app defect. 1. Set CGD's "Parent/Student Access Term" to blank (default) and set "Current Grade" to the right thing (Q3 in our case), so that home.html only shows current courses and looks sane. 2. Turn off the "Teacher Comments" icon altogether, since it's broken. 3. Add a note to home.html that says "For S1 grades and comments, see 'Grade History.'" 5. 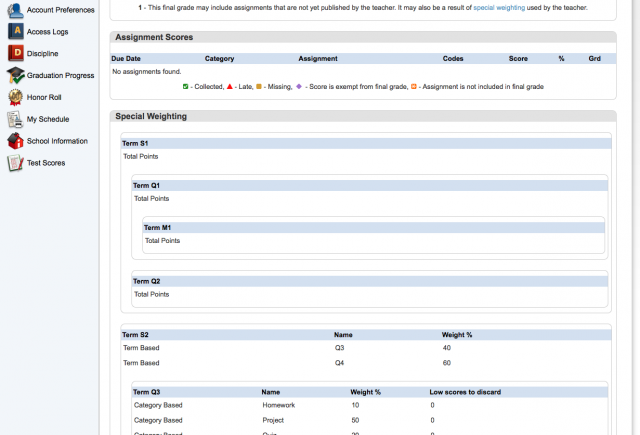 Add a note to termgrades.html that says "To see assignment details and teacher comments (if any), click the percent score." So, not as nice as having all the comments together on one page, but at least they're accessible without screwing up the rest of the portal! We're seeing this on both our 7.2.3 production server as well as our 7.6.1 test server. Still cannot get Course Requests to show!!! I've checked and set all three topics listed below and still cannot get the Course Request icon to show in the Parent Portal. Does this only work with the 'Single Signon' option? We do not have the Single Signon enabled. PLEASE DISREGARD. COURSE REQUESTS ARE NOW SHOWING. I have no idea why is took so long. We just implemented SSO and parents are reporting that the Assignment List for 12-13 is not being populated. On the home page, the parents see "Click Here to see a list of all your students past assignments for this term." Once they go to the page the default Time Frame is: Past 2 weeks but nothing displays for any of the options. Is this feature working or not? If it is how do I get it to work? Several of us have noted this above as well. In our case it is related to standards view being shown rather than the the traditional grading only. Reverting to traditional view allows people to see assignments again. No fix for the problem has been noted so far, except to do this. Not sure if this is your exact situation, but that is what is happening for a few of us anyway! This is a great customization but I would like to enable show/hide account management page that shows up for all accounts. This is one page setting that we do not want parents or students to update or change. As it does not exist, we had to hack this and couple it with Fees/Balances, so the code thinks it is a Fees/Balances object but it is Account Management. This is dirty and not clean but it gets the job done for the time being. If possible please add in the next update the ability to show/hide the account management page or even better write up how you enable the hide/show customization, I would love to learn how it ticks. I am also having trouble showing just assignments for the current reporting term while hiding the final grade. The show/hide score details page selection is good but removes too much information(i.e assignments as well). Something more granular like Remove Final Grade only from displaying, Remove Assignments for currrent Reporting Term etc would be great. Also is there a way to contribute to what you guys have already done so far so you guys could review it and choose whether or not to include it or not in the next release? We would like to be able to give access to more screens for our teachers. So my question is can I use this parent portal to do the same thing for teachers. Several of our pages in the Enhanced Parent Portal have "string key not found!" on the tabs including the email set-up page. We cannot get parent email to work. Is anyone else experiencing this issue and is there a known fix for it? I have a question about the new term page under the guardian section. I would like to remove the CIT code and the HRS code ..I also would like for the years and the store code to display not beside each other but in rows under each other..this is because I want to add the comments column beside the percent . I have customized the standard termgrades page to reflect what i want..but I would really like to give the parents the ability to see previous years. I have the rest of the Enhanced Parent Portal working, but the Graduation Progress is not working. We use the Graduation Plan progress and it displays perfect in PowerSchool Admin and PowerTeacher, but I can't get it to display in the Parent Portal. The column headings are not correct either which makes me think it is pulling something else that we aren't using. Any help anyone can give me would be most appreciated. Thanks! Can PS automatically send an email to a parent when a student has a missing assignment?